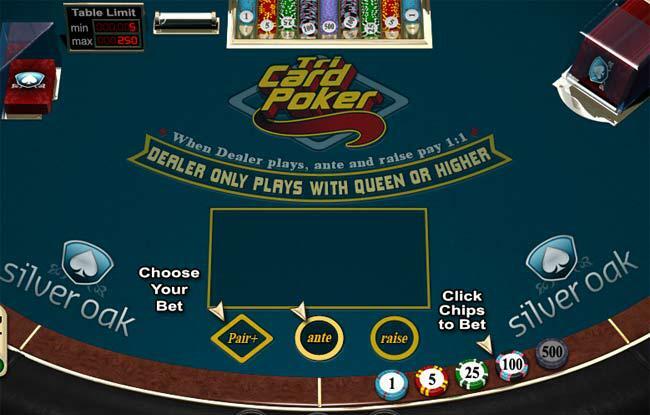 Three card poker is one of the more entertaining and simple games you can play at a casino. It combines the standard you vs. the dealer play (like blackjack) with an exciting bonus structure paying out as much as 35-1 (or more, depending on where you’re playing). Casino games are always more fun if you stand a chance at winning something big, instead of no more than the amount you were willing to wager. At the same time, no one wants to lose their roll betting on nothing but long-shots. The perfect marriage is to play 3 card poker at the casino. Want to know how to do it right? Read on. When learning to do anything new, you should always start at the beginning. You can’t play three card poker at a casino unless you can get yourself inside a casino. The first step is planning your trip to the tables. If you’re in Vegas you can just close your eyes and walk in a random direction, chances are you’ll end up right where you want to be… or parched and lost in the desert. If you can’t find anything close to where you’re at, you can always play three card poker online. In fact playing it for free online is the best way to get a feel for the game before stepping into a dimly lit room full of recycled air and cigarette smoke. After finding the table games you’re going to want to find an open seat at a three card poker table within the limit you want to play. Depending where you’re at most casinos will offer $5 or $10 as their lowest stakes. If you’re looking to spend less than that per hand, you’re going to want to look into playing online. Unlike games like Blackjack, it doesn’t matter where you sit at a three card poker table, each seat is the same as any other. Find a spot you think you’ll be comfortable in and take a seat. When the current hand is finished place your money you wish to exchange for chips on the table and then immediately begin to fondle the chips passed to you from the dealer. There are two separate bets you can make in 3-card poker, before any cards are dealt. If you look at the table you’ll see three circles at each seat: Anti, Raise (sometimes labeled as play or bet) and Pair Plus (could read as “Bonus”, “Pair+” or something similar). The dealer’s hand is only considered to “qualify” if their hand is queen high or better. Now if the dealer’s hand does qualify, and your hand beats it, you get paid even money on both your ante and raise bets. If the dealer’s hand does not qualify you will receive even money on your ante bet and have your raise bet returned to you. If the dealer’s hand qualifies and beats your own hand, you lose both of your bets. The second bet you play off the start is the bonus bet, known as Pairs+. This bet can be made on its own or in conjunction with the ante bet. The result of this bet is decided immediately after being dealt your three cards. The pairs plus bet at three card poker requires no strategy or skill, it’s a straight up wager with the potential for large returns on small bets. The payouts will vary depending on where you’re playing, but the most common bonus structure can be found below. When it comes to the ante and raise, the optimal strategy (based on math) is to only raise hands which are better than Q-6-4. According to the numbers this is the tipping point to getting the best odds possible in your favor. Of course, math means nothing to the man on a hot streak. Some times you just need to go with your gut. If you want to get some free practice hands in, give our tri card poker game a spin for free.